I don't know if there is any call for this type of thing but I had fun making them! 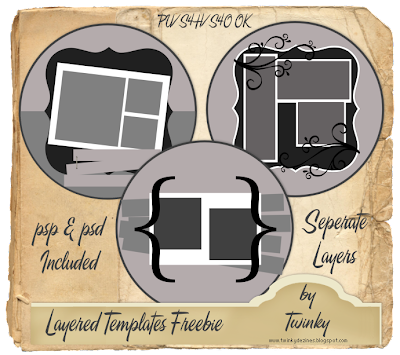 They are layered templates, for Personal Use, S4H & S4O. 1000 x 1000 pixels in size. Thank you so much for this Freebie. I want to let you know that I posted a link to your blog in Creative Busy Hands Scrapbook Freebies Search List, under the Template(s), Overlay(s), Photo Mask(s) post on May. 01, 2009. Thanks again. Thanks for the templates. I like the design! Thanks so much I love Round Templates. I use them to turn old CD's into beautiful hanging gifts. thank you, yes people use these alot to make cd albums and such. Thank you for the templates, they are awesome! !